You and Your Big Dreams: Woo-Hoo! Just popping in with a super quick post before I'm off to work. Today is the last day to play along with Lawnscapings CAS challenge (it only runs for two weeks, I mean it took me long enough lol) The main benefit of posting mid-afternoon is I was able to take my photo in natural sunlight. This almost never happens but when it does I can really see the difference between these and my late night photos. I am also entering this card into Gallery Idol 2011. I started by using white card stock to created a standard sized card. I stamped the trails and butterflies (Lawn Fawn, Critters in the Burbs) in jet black archival ink (Ranger). I colored them in using markers then added stardust stickles to the center of their wings and bodies. Once they were dry I stamped my sentiment (Lawn Fawn, Critters in the Forest) and added gems in matching colors. See told you it as quick :) Thanks for dropping by! Oh, this is so fun! 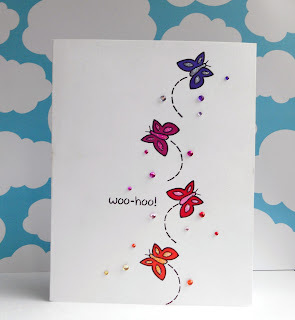 Love the sentiment along with those happy butterflies =) TFS! Oh I love this whimsical card! I love your subtle touches of gems. This is just fabulous! Thank you so much for playing with us at Lawnscaping! LOVE this card! The colors, the design, everything is just gorgeous! very cute. love all the color! So pretty and bright. Love it! Congrats on getting top Mow-it-All. I love this one...so CAS, but very cute! I love this one! Congrats on being a Top Mow-it-all with this one. It caught my right off the bat, I love the color change in the butterflies and you really are brilliant with gem placement.